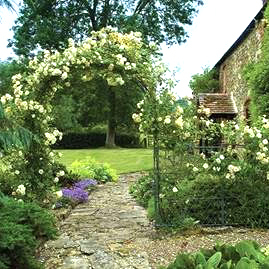 If you’re looking to add a quintessentially English touch to your garden this summer, or a modicum of shade in this hot weather, consider installing a steel garden arch over which you could train some beautiful climbing plants. The diamond lattice pattern of our wirework arches offers essential purchase for clematis and honeysuckle. For further details on any of our steel garden arches please contact us on +44 (0)1225 851577.